Hey wait I’ve seen that before; it’s the top of my bookcase! 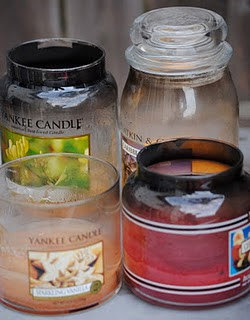 If you’re like me and have lots of used candles lying around and short of using each one for a few minutes you have no use for them, but you just can’t throw them away there is a solution. Thanks to easy directions by Kara at Happy Go Lucky I was able to bring new life to my “leftovers” and I’ll let you in on the secret too. I put the wax I chopped off the wick in the jar of the same scent and then after bringing my pot of water to a low boil I put one jar in to melt the wax. The amount of time it takes depends on how much wax you’re melting, mine took 15-20 minutes. After one jar was melted I poured it into the new jar w/wick, then melted the next old candle, the amount of time it takes to melt was enough for the previous layer to slightly harden so the two layers didn’t mix. Mr Yellow House says there’s not enough color difference, but it sure smells good!